The non-native species of salmon have been reported as far north as Tofino on the west side of Vancouver Island and Campbell River on the island’s east side, according to Byron Andres, head of the federal Atlantic Salmon Watch program. “Quite a distance. I’m not sure whether we should be surprised by that but they have travelled further than I initially anticipated,” Andres told Gregor Craigie, host of On the Island. The Atlantic Salmon Watch program has been monitoring B.C. waters since 1991 and in that time has rarely logged confirmed sightings. Between 2011 and 2017, there were only three confirmed reports of Atlantic salmon in B.C., with some appearing as far north as Hecate Strait and the Kitimat River. There had been zero reports in the three years leading up to the escape. 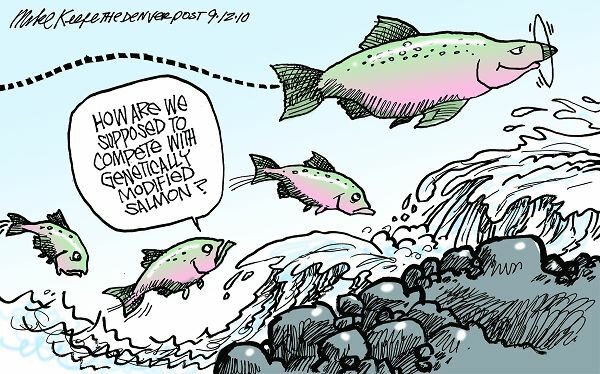 So now we monitor and try to assess what happens when you release hundreds of thousands of salmon from one ocean into an entirely different ocean. Exactly the sort of science project you get when you play Sorcerer’s Apprentice by manipulating and short-circuiting nature with the goal of farming lots of affordable salmon. Here’s the audio for a fuller version of the story. Do Orcas At Marine Parks Injure One Another?